Salmson was a French engineering company, initially in the automobile and aeroplane manufacturing area, turning to pump manufacturing in the 1960s. It was established by x�mile Salmson (1858-1917) as Emile Salmson, Ing. as a workshop in Paris (1890), making steam-powered compressors and centrifugal pumps for railway and military purposes. Subsequently joined by engineers Canton and Unn�, it was renamed Emile Salmson & Cie, building petrol-powered lifts and motors (1896). The company became one of the first to make purpose-built aircraft engines, starting before World war I and continuing into World War II. After World War I the company looked around for other work and started making car bodies and then complete cars. Car production finished in 1957. Focus also moved back to pump production and the facilities moved to Mayenne in 1961. The firm was bought by ITT-LMT in 1962 and then by Thomson in 1976. Its headquarters today are in Chatou. 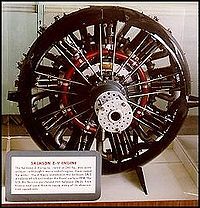 It moved to Billancourt and manufactured the Salmson 9 series of water-cooled radial engines. During World War I Salmson made its first complete aeroplanes, mainly the two seat fighter/reconnaissance plane, the Salmson 2A2. These were used in combat by both the French and the American Expeditionary force. The company also designed a prototype of a single seat scout/fighter, the Salmson 3, but this was not produced in large quantities. Salmson aircraft were also used for air mail to India in (1911). Aeroplane manufacturing moved to Villeurbanne near Lyon. Two world records were set by Maryse Basti� who flew Le Bourget to Moscow (1931). The Billancourt factory became the car manufacturing plant directed by Emile Petit. As the firm had no direct car design expertise they started by building the British GN cyclecar under licence, displaying six cars at the 1919 Paris Salon. In 1922 the car part of the business became a separate company, named Soci�t� des Moteurs Salmson. The first Salmson car proper used a four-cylinder engine designed by Petit with unusual valve gear: a single pushrod actuated both inlet and exhaust valves pushing to open the exhaust and pulling to open the inlet. This was used in the AL models from 1921. 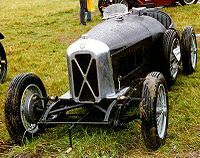 Later the same year the company built its first twin-overhead-cam engine, which was fitted to the 1922 D-type, although most production at first used the pushrod engine. Salmson won 550 automobile races and set ten world records (1921-28) before closing the racing department in 1929. 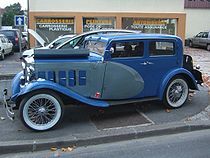 The S-series cars took over from the D-type, starting in 1929 and becomong a long lived series. The firm also made the 2A2 de A�ropostale aeroplane. 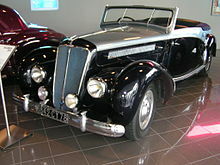 After bankruptcy in 1953, all activities ended in 1957 and Renault bought the factory. Salmson Pictures and Salmson for Sale.